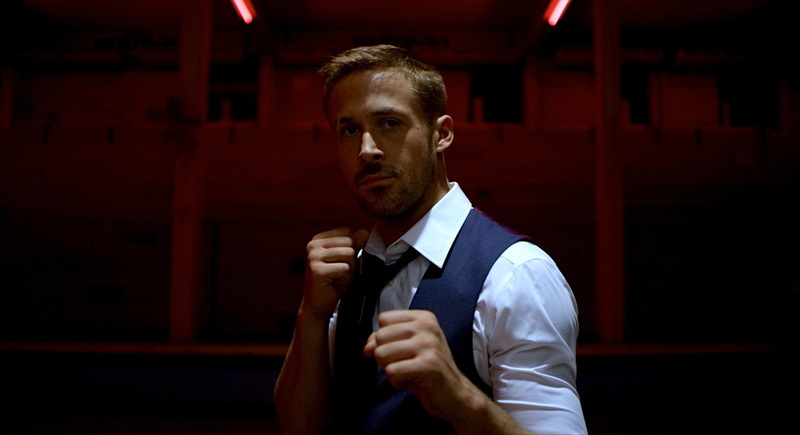 This article is a review of ONLY GOD FORGIVES. Ryan Gosling fights god. You haven’t misread. A wrathful god in human form. There’s also karaoke. Maladjusted romance. Thai boxing. Revenge and counter vengeance. Sin and redemption. Nicolas Winding Refn, director of the now beloved DRIVE, has re-teamed with its star, minimalizing dialogue and characterisation further, and upping the eye candy. The set décor is as ornate, if not more so, than this year’s THE GREAT GATSBY. The neon soaked streets of night-time Bangkok rival the glorious 1980s milieu of Ridley Scott’s Tokyo depicted in BLACK RAIN. Julian (Gosling) and his older brother, Billy (Tom Burke), are American drug smugglers operating out of Thailand. The former reeks of self-hatred, while the latter is a murderous sociopath, who kills a young prostitute one evening. Unable to make himself leave the crime scene, he is found and locked into the room with the victim’s father. Billy is bludgeoned to death. Half his head is missing when we return. That killing is the last confirmed death off camera. From then on, it is front and centre. No quarter is given for the squeamish. There maybe a message behind the ferocity of the violence, but it feels like headline-grabbing ammunition. That policeman, who locked the father and perpetrator in the room, at first glance seems corrupt. His name is Chang (played formidably by Vithaya Pansringarm). He is the opposite of corrupt. Chang it appears is god, and is moving through his flock executing the murderers, and mutilating the unrighteous - skewers through limbs, hot oil to the face. And Chang wields a sword artfully, pulling it from an invisible scabbard when required. He punishes the father, but lets him live. Julian goes after his brother’s killer, only to spare him at the final moment; though the father’s luck runs out when Billy’s mother Crystal (a scene eviscerating Kristin Scott Thomas) lands. When Chang discovers this new murder, he wreaks havoc through the chain of culpability. The performances are electric, doing much with little meat. Chewing air. And that is the problem - Refn’s films are starting to look more and more vacuous. The ilk of the PUSHER trilogy and BRONSON and DRIVE and ONLY GOD FORGIVES are exhilarating and terrifying. However, the director’s cinematic language suggests depth, but when prodded, there looks to be little to get one’s teeth into. That’s what makes his actors’ performances all the more redoubtable. (The less said about the pretentious duo of FEAR X and VALHALA RISING the better.) Don’t get me wrong, Refn has skills, and is clearly a cinephile – look at his collaboration with the British Film Institute on the release of the obscure NIGHTBIRDS. The director’s look at religion and a deity here is all veneer unfortunately. The brutality is what sticks after the curtains close, not any kind of substantial theorising. Ultimately ONLY GOD FORGIVES is superficial theology and gaudy fetishism, treading a fine line between the nightmarish and the comical; but is so brazen and compelling.